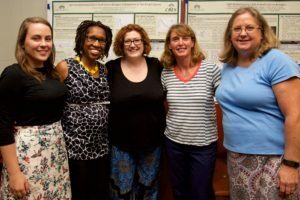 Making Connections: Is There a Correlation between the Written Word and the Lives of African American Children’s Authors? “Making Connections: Is There a Correlation between the Written Word and the Lives of African American Children’s Authors?” is a unit for the middle school adolescent that encompasses multiple Common Core standards in the academic field of English/Language Arts. This unit is intended to enrich students’ academic knowledge through a two week interdisciplinary unit focused on African American children’s authors and their novels. Its purpose is to teach how a key individual, event or idea is introduced and elaborated in a text through examples and anecdotes while exploring the back stories of the various African American writers who have given birth to these stories. Specifically this unit compels students to learn about the people who write the stories they love to read, and to make connections between the written word and the unspoken human interest stories of those authors. This unit explores the lives of four prolific children’s authors: Christopher Paul Curtis, Mildred Taylor, Virginia Hamilton and Walter Dean Myers. Through the use of an interactive webquest, students investigate the lives of these authors, create desktop biographies, hone their interviewing skills and complete a photo journaling assignment focusing on what molded their subject into the people they are today. Posted on March 5, 2013 by Scott Gartlan. This entry was posted in 2012, Curriculum Units, Vol 2: Reading African American Lives and tagged African American, Children's Authors, Ficion, Literature. Bookmark the permalink.